Have weeds stolen your pond from you? 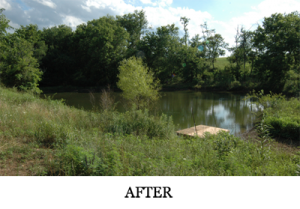 Trophy Pond is a certified commercial applicator for aquatic herbicides, specializing in weed control and removal, and can give you back your lake or pond, safely and professionally. Now serving Tennessee, Alabama, Kentucky, Mississippi, and Georgia. 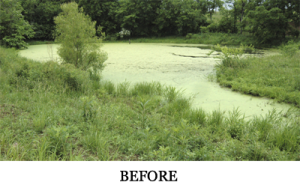 There are some species of aquatic vegetation that can help a pond, fostering everything from improved water quality to bigger and healthier fish. But there are other species that can kill every fish in the pond if left uncontrolled. Once we’ve identified what vegetation is present, we look further to determine the specific conditions in the lake that are causing that particular weed to thrive, and address those conditions: in other words, we treat the cause rather than just the symptom, so that the same weeds don’t return a few months or a year later.